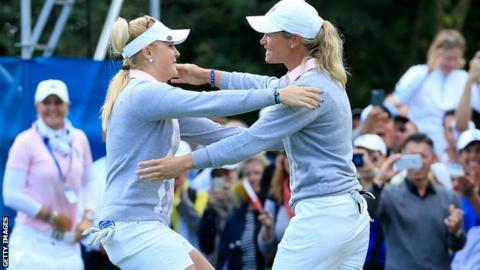 Charley Hull and Suzann Pettersen's remarkable victory helped Europe extend their lead in the Solheim Cup over the United States to 8-4 in Germany. The pair were four down with seven to play against Morgan Pressel and Paula Creamer but birdied the last four to win their foursomes match one up. Europe's Melissa Reid and Carlota Ciganda won their match 4&3, and Sandra Gal and Catriona Matthew won one up. America's Stacy Lewis and Gerina Piller were 5&4 winners in the last match. England's Hull and Pettersen of Norway looked set for defeat in their match but 19-year-old Hull birdied from 15 feet on the 12th hole to reduce the deficit to three holes. The momentum continued to swing when Hull, who has now won all three of her matches, was an inch away from a hole-in-one on the 15th. She then holed from four feet on the 16th after a superb pitch from Pettersen from heavy rough. Another birdie from close range on the 17th pulled the European pair all square for the first time since the second hole, setting the stage for Pettersen to hole from 10 feet on the 18th to complete a sensational win. "That was robbery," said Pettersen. "The greens are so soft I told Charley, let's throw darts at the pins, stay aggressive. "You just have to tell her to hit it right at the pin. She is awesome. It's fantastic to play with her." England's Reid celebrated her 28th birthday by teaming up with Spain's Ciganda to beat Michelle Wie and Alison Lee 4&3. Reid said: "It was a great game. Carlota hits the ball miles and there is no stress for me. If I hit it off line I have complete faith in her. She's like Sergio (Garcia) and Sevy (Ballesteros) - an unbelievable player." Germany's Gal and Scotland's Matthew won for the second time against Angela Stanford and Brittany Lincicome. Anna Nordqvist and Caroline Hedwall were the only home duo to suffer defeat, the Swedish pair losing to a rejuvenated Lewis and Piller, who were an approximate seven under par for their round in the alternate shot format. Saturday afternoon sees the final round of fourball matches. They need 14 points to retain the Solheim Cup, while the US need 14.5 points to regain the trophy.